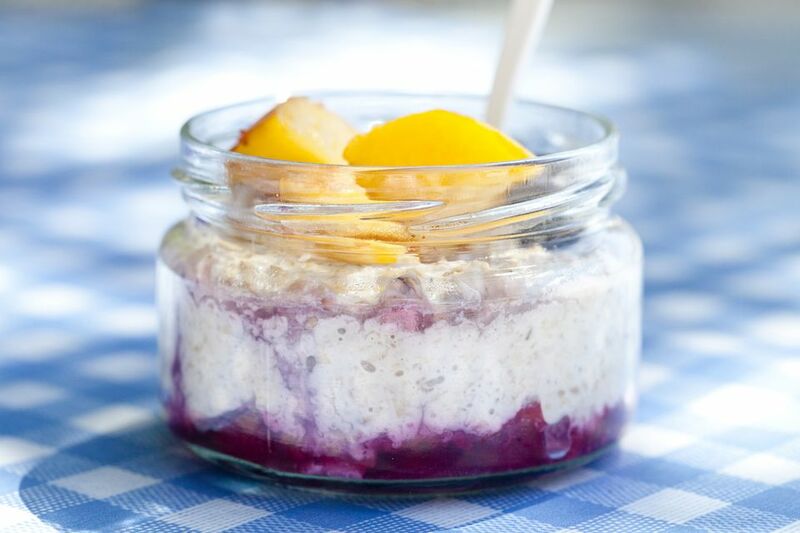 Overnight oats are one of our favorite quick, easy, and healthy breakfasts, especially for busy mornings when time to prepare a nutritious breakfast is lacking. As the name implies, this breakfast takes "overnight" to come together. The night before, combine certified gluten-free old-fashioned rolled oats with your favorite dairy or non-dairy product, i.e. milk, almond milk, cashew milk, soy milk, Greek yogurt, etc. as well as a hint of natural sweetener such a maple syrup, agave nectar, or honey. When the oats chill overnight, they soften as they absorb the milk/yogurt and sweetener. The mixture will thicken into a hearty and healthy start to the day by the time you wake up in the morning. In a small bowl, combine the gluten-free rolled oats, choice of milk, non-dairy milk, or Greek Yogurt, and choice of sweetener. Cover and chill overnight. In the morning, stir the overnight oat mixture. Add additional milk, non-dairy milk, or Greek yogurt if a thinner consistency is desired. Garnish overnight oats with a choice of toppings, i.e. fruit, berries, seeds, nuts, and/or additional sweetener. Enjoy right away, or pack garnished breakfast in a to-go container to enjoy later in the morning. The recipe below is a simple blueprint for preparing gluten-free overnight oats, a basic outline of simple building blocks. You add the flair and customize it to make it your own! Stir the overnight oats in the morning and add additional yogurt or milk if you desire a thinner consistency. Using Greek yogurt will result in a very thick breakfast; if you go the yogurt route, always add a few more tablespoons of Greek yogurt in the morning to make the mixture thinner and creamier. Once you have your base, now comes the fun. Add sliced strawberries, bananas, raspberries, blueberries... or all four! For additional protein and fiber boost, you can mix in a tablespoon of flax seed, chia seeds, or hemp seeds. For a sweeter kick, add additional honey, maple syrup, or agave nectar to taste. For more crunch, add your choice of chopped nuts, such as almond, walnuts, or pecans. Note about gluten-free oats—Oats are often grown in the same fields as non-gluten-free grains, such as wheat, barley, and rye, and harvested, stored, and processed with the same equipment. Because of this cross-contamination issue, consuming "regular" oats when following a gluten-free diet can be risky. When shopping for oats and oatmeal, be sure to check the label to ensure they are certified gluten-free. It is important to note that a small percentage of those following a gluten-free diet for health reasons react to oats (even if certified gluten-free) because of a protein in oats called avenin. It is recommended to consult with your doctor about introducing oats into your diet if you have gluten-related health issues.